Jeremy Adelman to Lecture on "A Global History of Humanitarianism"
The Department of History and the Center for Latin American Studies invite you to a lecture by Jeremy Adelman, Henry Charles Lea Professor of History, Princeton University. He will speak on "The Witness and the Other: Towards a Global History of Humanitarianism" on Wednesday, May 4, 2016, at 4:00 PM in Harper 140, 1116 East 59th Street. The lecture is open to the public and a reception will follow. 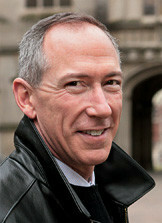 Prof. Adelman's books include Frontier Development: Land, Labour, and Capital on the Wheatlands of Argentina and Canada (1994), Republic of Capital: Buenos Aires and the Legal Transformation of the Atlantic World (1999), Sovereignty and Revolution in the Iberian Atlantic (2006), and Worldly Philosopher: The Odyssey of Albert O. Hirschman (2013). His Latin America: A Global History is forthcoming from Princeton University Press, and he is currently working on the history of the world as an idea.